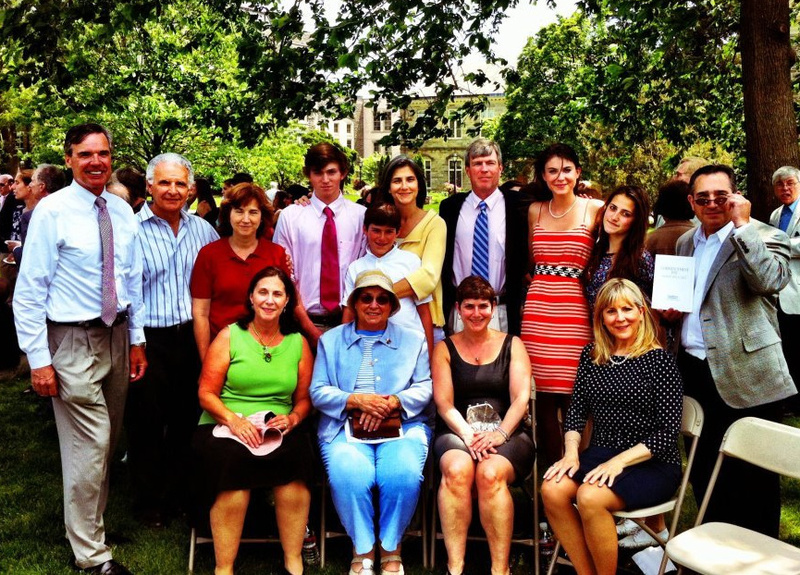 This past Sunday, Kate Mundell graduated from Haverford College. It is now a Mundell tradition. Paul Mundell, Sr is an alum and Paul Jr. will be attending this fall. Betsy met Paul while attending neighboring Bryn Mawr College. Several family members traveled for the event. While together, they also celebrated James Dale’s 12th birthday. Today is Kate’s birthday. Congratulations Kate, and happy birthday to you and James! Here is the group who attended the graduation. This entry was posted in Family news, Uncategorized. Bookmark the permalink. I was about to say, wow, what a good looking group, but see Hallie beat me to it — plus he has a great haircut too. Mom says Margaret is better looking than Halle Berry (the short haircut prompts people to say she reminds them of Halle), and we decided that we’re ALL better looking. And better cooks than freaking Lydia. It was a beautiful weekend. Thanks again to everyone. What a great time we had. So proud of Kate. It was wonderful to be a part of the celebration.